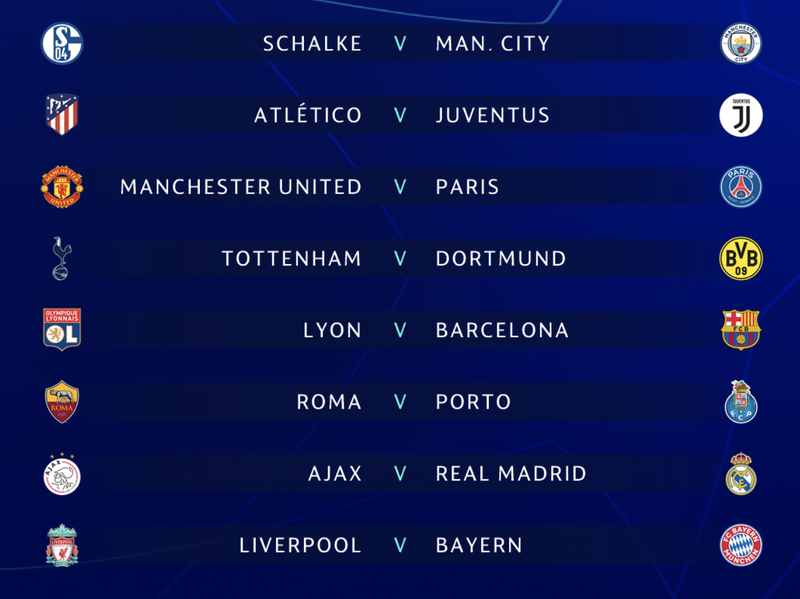 The Champions League draw for the Round of 16 went down on Monday morning, and three of the four advancing English teams are going to have a very difficult road. Tottenham drew Bundesliga leaders Borussia Dortmund; Jurgen Klopp’s Liverpool got perennial powerhouse Bayern Munich; and—in the marquee match-up—a struggling Manchester United got Ligue 1 monopolists Paris Saint-Germain. The lone English team to win its group, Manchester City, can breathe a sigh of relief: Their opponents are Schalke, who finished second in a weak group and have only picked up 15 points from 15 games so far in their domestic season. Outside of Britain, Atletico Madrid and Juventus will be the most interesting matchup, with the Spanish side just falling to second in their group by virtue of goal difference against Dortmund, and the Italian giants beating out Manchester United to finish first in Group H. Elsewhere, Barcelona should have it easy against Lyon, but Real Madrid may face some difficulties against dark horse challengers Ajax, who can score like crazy and went unbeaten in Group E. The second-tier pairing of Roma and Porto will get mostly ignored. The tournament resumes on Feb. 12 next year, with Man Utd–PSG the main event of that day.